Having found that Motiv has made the move from a chaplaincy with a church agenda to a secular engagement with the university (but informed by Christian understanding), I am surprised to attend a morning worship service in an “Ecumenical Church” and to find the MoTiv logo sitting proudly on the front page of the order of service. How is this? Are these MoTiv chaplains engaged in the university to feed new members into this church? Or is this a church set up to provide support for the MoTiv chaplains, and so indirectly to the university they serve? The answer seems to lie in the way things have evolved rather than any grand plan. 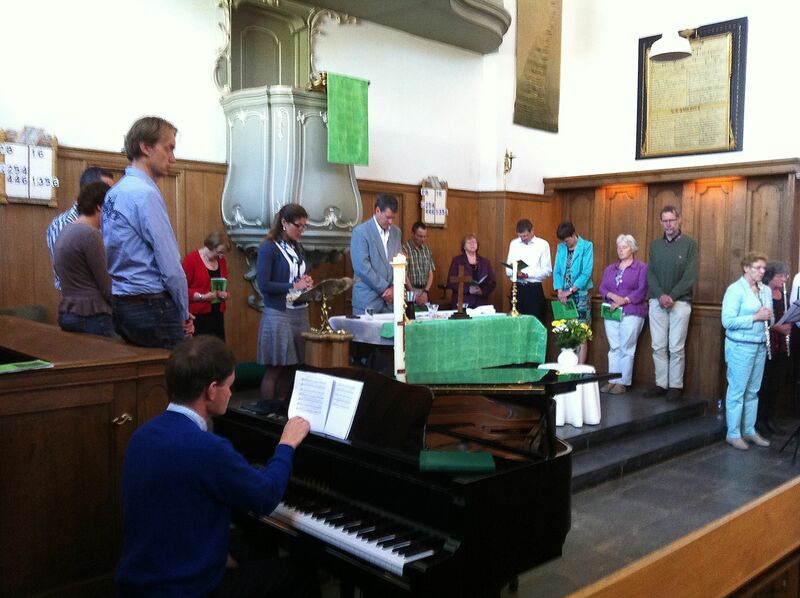 Hans, officiating at communion (centre), used to be the Protestant Chaplain to the Protestants at Delft University and Pastor to three congregations. Two of these collapsed and this one that continues has been able to fund Hans as a chaplain half time within the newly formed MoTiv ecumenical team. So that is Hans’ connection to this church. But what of the other members of the MoTiv team – this is their church also! It seems that, led by the university chaplain, this congregation was open to accepting people who “didn’t fit” elsewhere. I met a handful of these people. A striking man made his way to me across the pews immediately the service concluded. It turned out he is a Catholic Professor of Theology. ‘What is he doing here?’ I wonder to myself. I reach over to shake hands with his wife and we immediately jump into a conversation about Holland and Australia and our relationship with the USA – we conclude that we are more alike than with the Americans. It turns out that the Professor has married a strong Protestant. Ton, a Catholic Motiv chaplain, and Renske, a Protestant one, had conducted the ceremony. Where else might they worship but at an ecumenical church? Over coffee I was introduced to Otto, who lectures in Ethics at Delft University. (He is the tall one standing next to the lady in purple). We were joined by the lady in the aqua coloured top (on that lady’s left) who is a former executive in Shell and has travelled to Australia many times. Now she runs her own leadership development consultancy. I was very interested to hear her say that there has been quite a lot of recent research demonstrating that the founders of new ventures rarely are the one who grow it. (I think she is talking to me!) That function is usually the province of the first one to catch on from the leader. Apparently there is a YouTube clip, “First Follower” where the leader is dancing by himself in a crowd. It is not until one other person decides to join in that the rest follow. What the leader does to embrace the “first follower” is crucial. It’s endlessly fascinating what you learn when you go to a church of people engaged in the world. This entry was posted in MoTiv Delft and tagged church, ecumenical, followers, leadership on June 2, 2013 by Geoff Boyce.